Until the angel came, Penny, Mark and Marigold were bitterly unhappy. Barry Hunter was bullying them and everyone at Nitshill Road School knew it. But the angel brings a clever solution. Life at school is going to be very different from now on. Shortlisted for Federation of Children's Book Groups Award, 1993. "Full of acute perceptions about bullying and how to stop it"
"A lively fast read, entertaining but with food for thought." 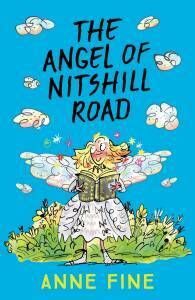 The Angel of Nitshill Road is written for children in the middle age range. It was first published in 1993, reissued by Egmont in a new edition on 1 September 2002; Anne Fine has written about the changes she made to update that edition in two articles, one aimed at child readers and one intended for parents and teachers. The Angel of Nitshill Road has again been reissued as one of a collection of updated editions in February 2018.
or as a Kindle eBook.